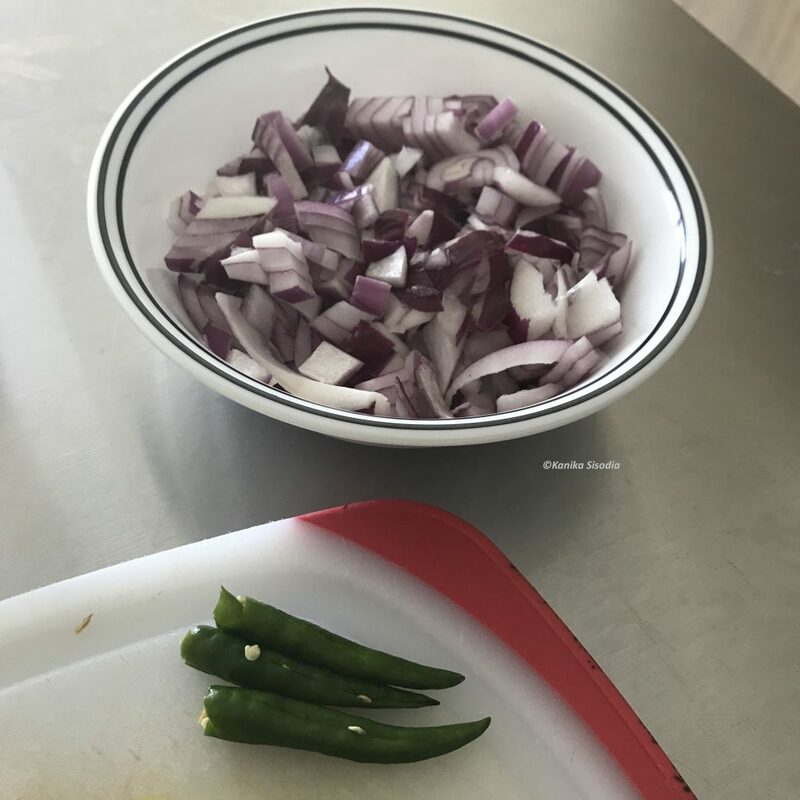 Instant Pot Chhole Masala — Kitchenpostcards A Dilli comfort food! It’s almost been a year since I moved to Chicago from India. And, for several months I have been contemplating the interconnectedness of food with nostalgia and memory. When the flavours of curry leaves waft from my aloo curry I can imagine my grandma labouring over the chullah and smiling at me. Rajma chawal always brings fond memories of my school days in Nainital. Similarly, cooking Chhole Masala transports me to the bylanes of Delhi. Chhole is a north Indian favourite and is cooked and eaten with relish all over Delhi. 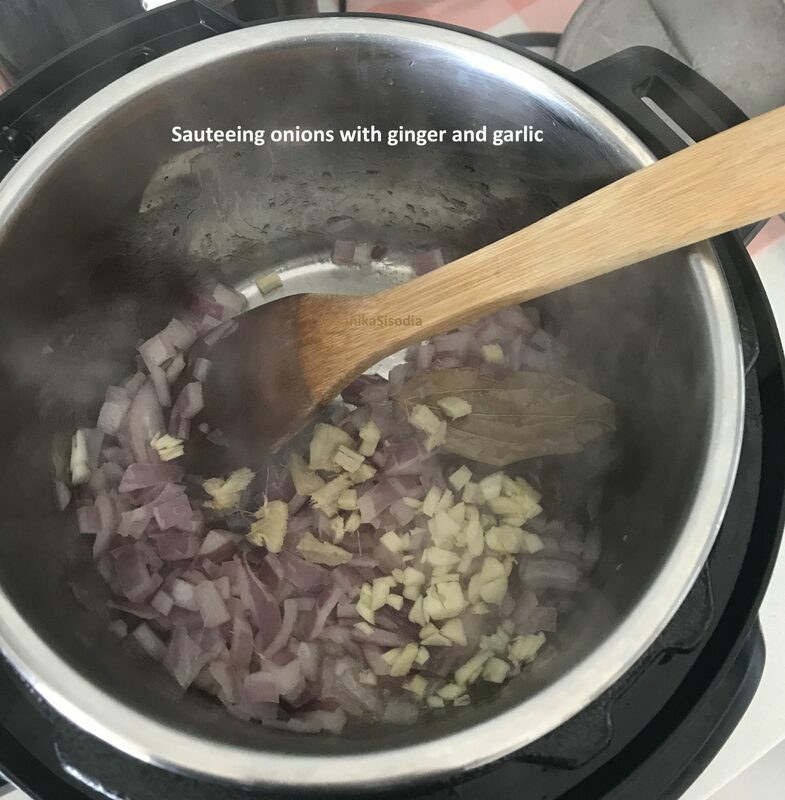 I have adapted the recipe to my taste and pace here in Chicago and sharing this with the thought of making cooking easier and savoury for Instant Pot users! Soak 1 cup chickpeas overnight. Pressure cook the chickpeas for 2 whistles on low heat and set aside. Do not throw away the water. 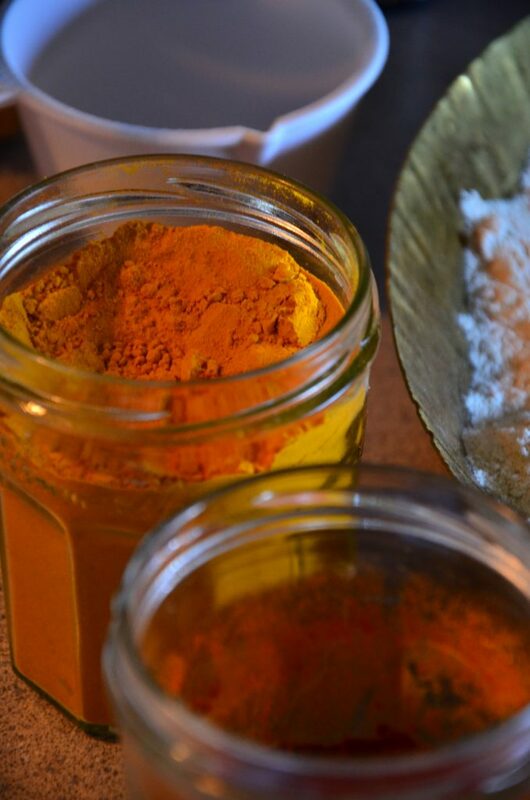 The tadka uses simple ingredients that you would easily find in your fridge. 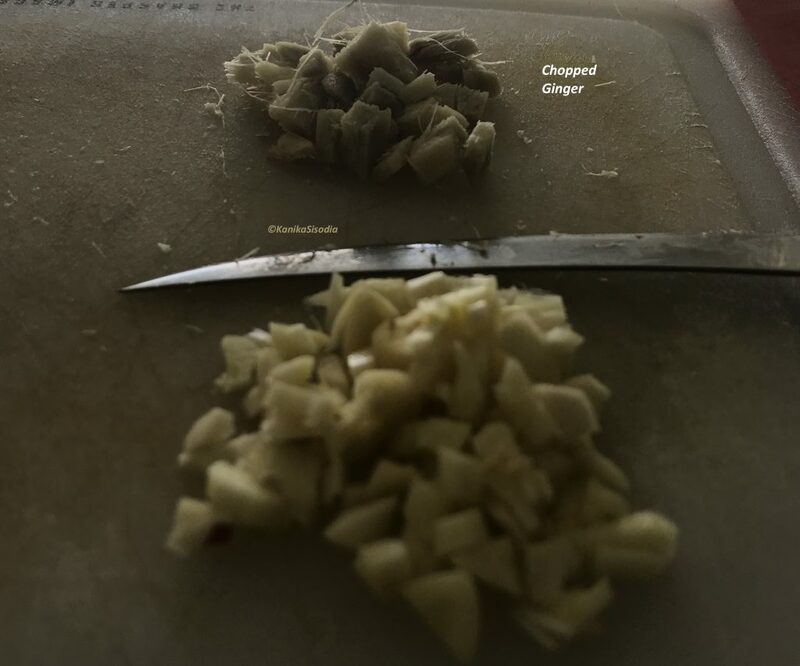 Wash and peel the ginger and garlic. Then chop both finely. You could adjust the amounts used based on your taste and preference. The green chillies used here were split lengthwise. A lot of time these are finely chopped as well. Be careful about using the pith and seeds since they pack the most heat. Remove these to reduce the heat of the chillies. Finely chop an onion and keep aside. Puree a tomato in a blender. Or alternatively use canned tomato puree. 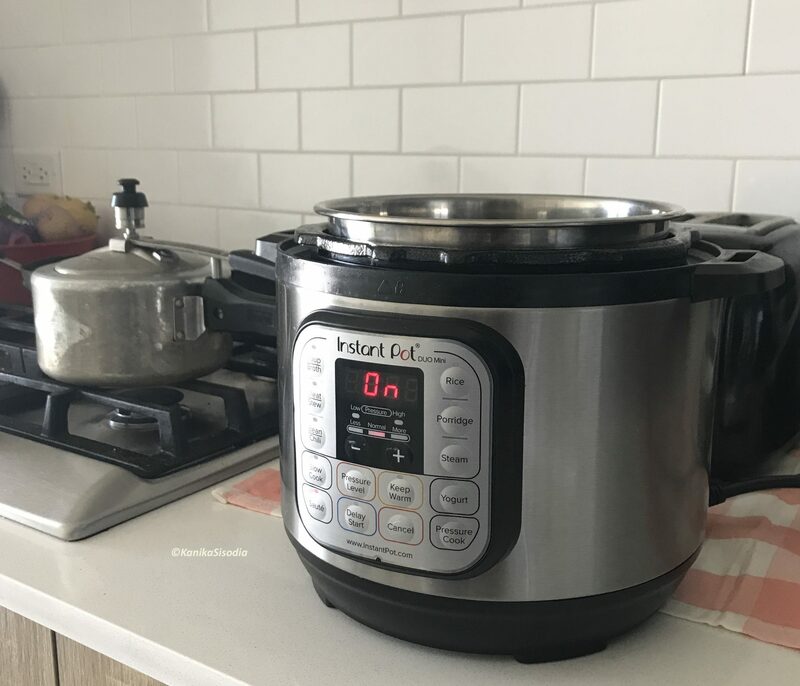 Switch on the Instant Pot on Saute Mode and pour oil, let it heat for a while. 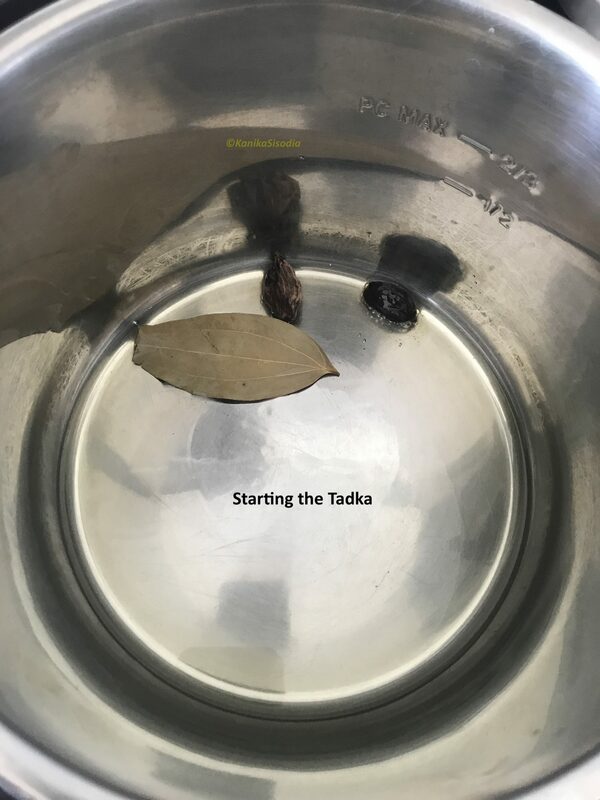 Once hot, add the black cardamom and bay leaf. Once fragrant move on to other ingredients. 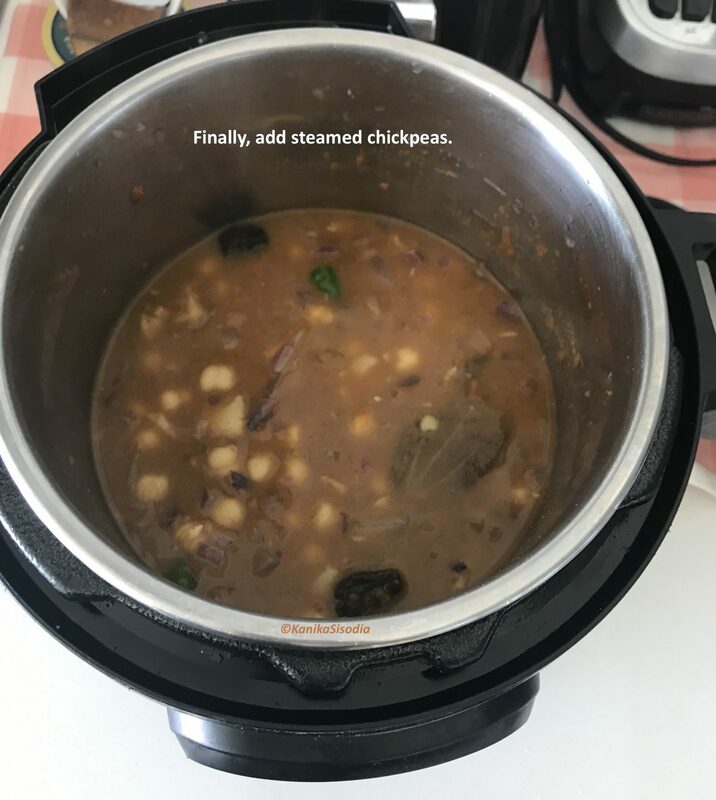 Instant Pot in the saute mode. After the whole spice, add the onions and saute until translucent. To this add chopped garlic and ginger and stir for a minute followed by green chilies and stir for another 30 seconds. Follow by adding the tomato puree; stir and incorporate. 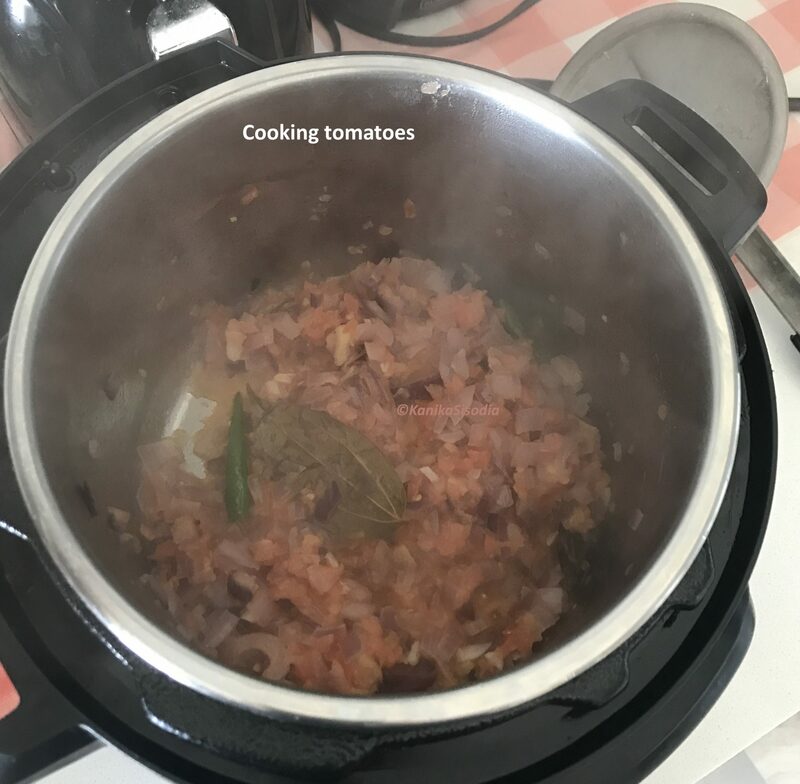 Once the tomato puree has begun cooking and seems to be losing water, add the chana masala and mix well. Now, add the chickpeas along with all the water and stir. Add Salt to taste. Now, cancel the saute mode and close the lid in the sealing position. 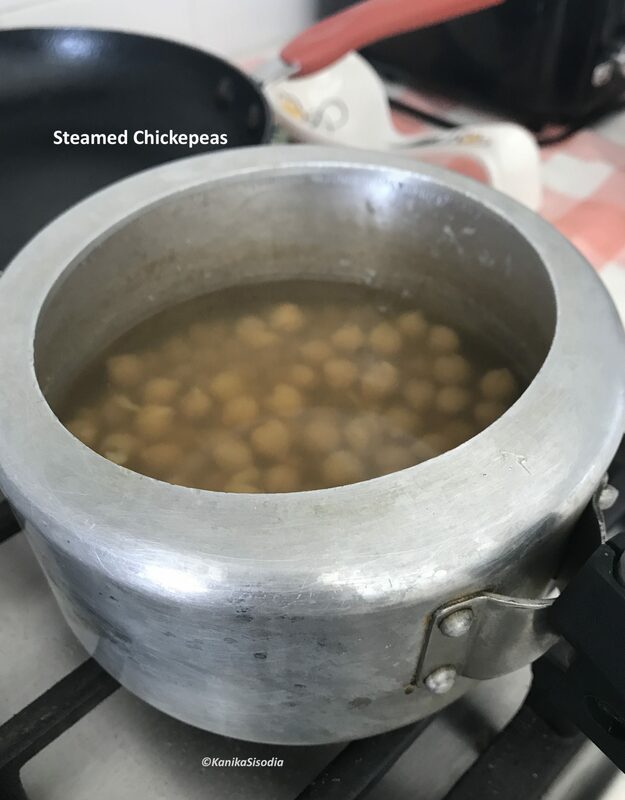 Pressure cook the chickpeas for 18 mins and let the pressure release naturally. Masala Chole is now ready! Garnish with chopped coriander and serve with rice or puris along with a side of raita or plain yogurt. 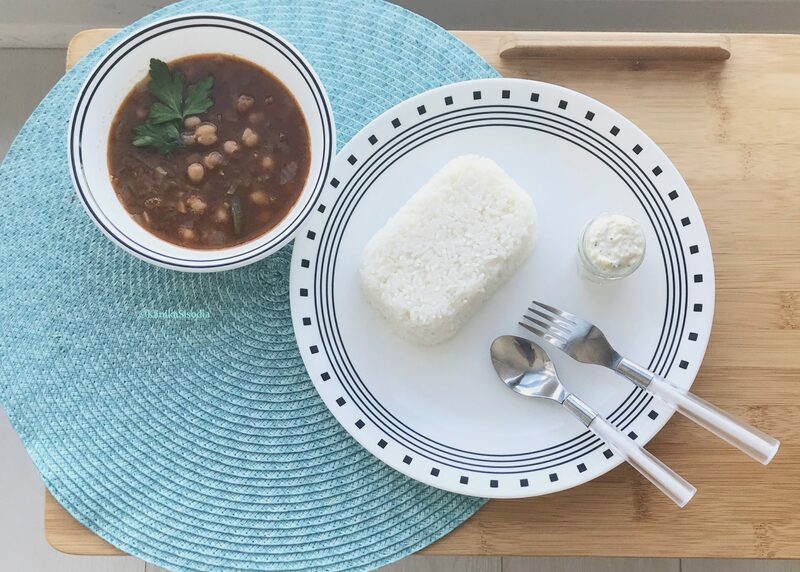 Serve with long grain basmati rice and raita or plain yogurt. Chhole is a north Indian favourite cooked and eaten with relish all over Delhi. 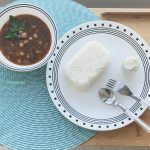 This recipe is adapted for the Instant Pot. Try Instant Pot Chhole today! Soak 1 cup chickpeas overnight. Pressure cook the chickpeas for 2 whistles on low heat and set aside (Do not throw away the water). 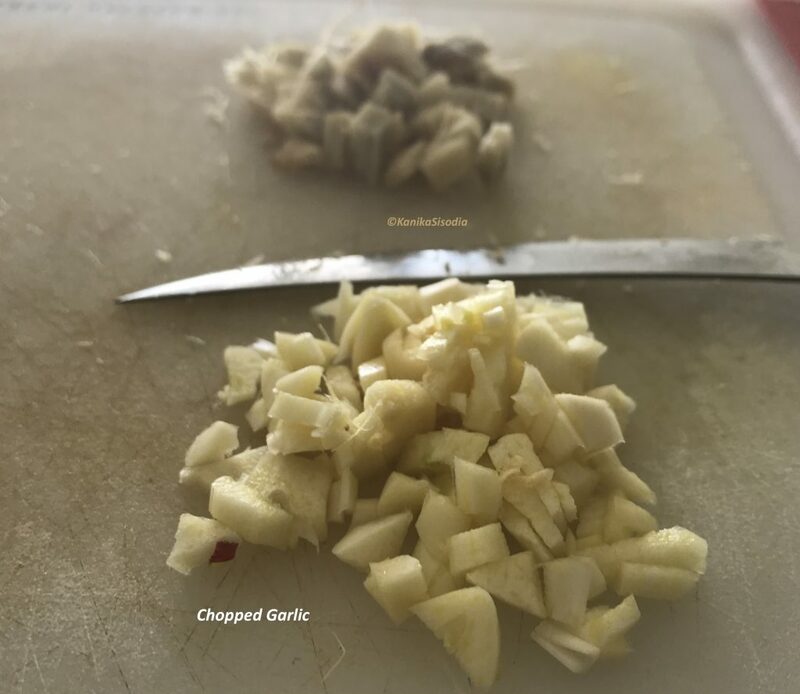 For the tadka wash and peel the ginger and garlic and chop both finely. The green chillies used here were split lengthwise. Finely chop an onion and keep aside. Puree a tomato in a blender or use canned tomato puree. Once hot, add the black cardamom and bay leaf. After the whole spice, add the onions and saute until translucent. To this add chopped garlic and ginger and stir for a minute followed by green chilies and stir for another 30 seconds. Add the chana masala and mix well. Now, add the chickpeas along with all the water and stir. Cancel the saute mode and close the lid in the sealing position. Thanks Pranita! Hope you get to try the recipe. We’d be happy to hear your feedback.